It's two cleaners in one! I mixed up a batch of the homemade shower cleaner and sprayed it liberally around the tub in my boys’ bathroom, which needed some serious help at the time. I let the spray work its magic for an hour or so, and then wiped it down with a sponge and rinsed everything off. And I was honestly shocked! This cleaner had done what so many other bathroom products had failed to do – it had managed to penetrate that stubborn, grimy, super-scum layer to reveal the clean, shiny surface underneath. I didn’t even know it could look that clean! I’ve been using this magic soap scum remover for about 4 years now, and I’ve never looked back. 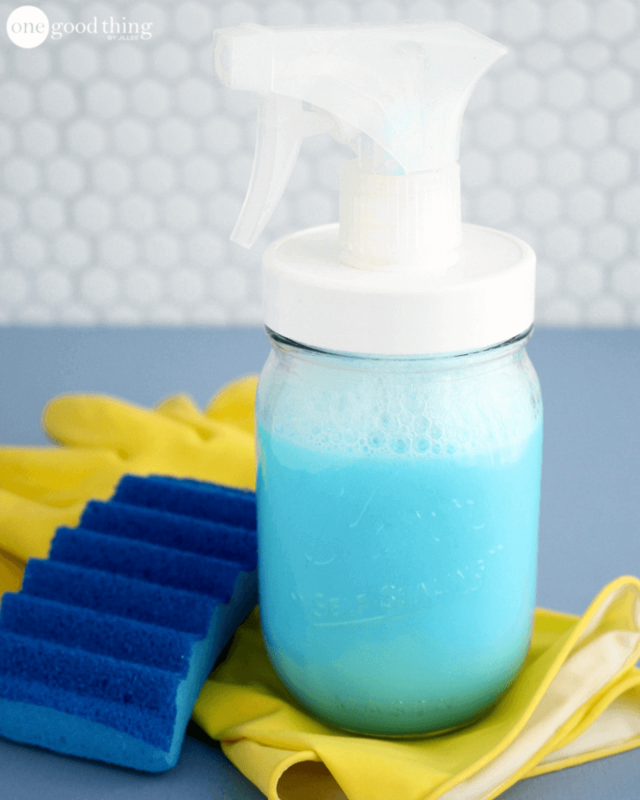 Here’s how you can make your own homemade shower cleaner. Pour the Dawn soap into the bottle as well, then put the lid on and gently shake to mix. Spray liberally around your tub and/or shower. Let the mixture sit for 30 minutes to an hour, then scrub (if needed) and rinse well. When using, make sure your bathroom is as well-ventilated as possible. Turn on the fan and open any windows, because this stuff is POTENT. It smells really strongly of vinegar right after spraying it, but the smell does dissipate fairly quickly. If you really can’t stand the smell of vinegar, you could throw a bandana around your mouth and nose while you’re using the cleaner. But the end result is well worth it, I promise! Read More: My Top 50 Favorite Posts Using One Of My Favorite Things – Vinegar! Dawn dish soap cuts through stubborn grease and grime like nobody’s business, and it has almost as many uses as vinegar! The soap also makes the homemade shower cleaner thicker, so it clings to the walls and floor of your tub and shower, rather than running right down the drain. I have just move to a new apartment and the shower has a really bad soap scum build. I clean it when I move in thinking that the cleaning people hadn’t done it. However no matter what I try, I cannot get the build off at all, and it looks dirty; so I am crossing my fingers that this really helps because honestly I am about to throw in the towel. Is this something that can sit in the spray bottle for multiple uses? I’m looking for something that I don’t have to make every single time I go to clean my bathroom (I like to clean a lot), and I’m worried that since the vinegar needs to be heated that I’ll need to mix it new every time. You can save any unused product until you need to use it again. I didn’t warm the vinegar at all when I mixed it. I think it just helps to break down/mix with the dawn dish soap. Mine mixed up just fine without heating. Thank you so much for this tip. I was dubious to so the least when I read your article, we had tried all sorts of chemicals in our bathroom to remove stubborn soap scum, to no avail. Then you recommend vinegar and dishwasher detergent, no way! How wrong we were, after following your method the scum simply wiped straight off, no elbow grease required! Amazing, thanks again for sharing! Hello there, I tried the vinegar, dawn method on my showers and my tub. Worked very good except for the foot marks. One thing I found; don’t leave it on longer than the stated time. It dried up and was a lot harder to clean. Thought I could do them all at once. Nope. The fumes were really bad (in my opinion) even with the bathroom fans on. No windows in my bathrooms. I resorted to the scarf over face idea but it didn’t help that much. In the long run, yes, it worked great! I can’t wait to try this cleaner! I also love the cute spray bottle. Where did you get it? The link is no longer working. Where did you get the lid? TIA! I just tried this on my moldy shower(not cleaned for over a year) and I heated the vinegar,added the Dawn, sprayed the shower, let it set for a hour, then wiped it down with a rough sponge. I couldn’t believe how much scum washed off and how easy it was to clean.I will get rid of all my store bought products and only use this formula.Thank you for this. If I can’t find Dawn Washing Liquid, then can I use some other? ?